Liudmyla Monastyrska, soloist at the National Opera of Ukraine, has a lyrical-dramatic soprano with rear beauty and power. She conquered the Kyiv audience by brilliant performance of such complicated and bright parts as Aida from the eponymous opera by Verdi, Santuzza from Mascagni’s Cavalleria rusticana, Liza from Tchaikovsky’s The Queen of Spades, Amelia from Verdi’s Un ballo in maschera. Now she has a whole army of admirers in Great Britain as well. The foreign critics call her a rising singing star of world scale, a follower of the traditions of Solomia Krushelnytska, Maria Callas, Montserrat Caballe, and predict a brilliant future for the Ukrainian diva. Liudmyla is a bright representative of the Ukrainian vocal school. She was an external student of the famous pedagogue Ivan Palyvoda at the Kyiv Music College. At the National Music Academy of Ukraine she was taught by the wonderful singer Diana Petrynenko. In 1997, Liudmyla won the Lysenko Competition of Singers, where she impressed the jurors by wonderful performance of Aida’s aria (after this performance she was invited to work with the troupe of the National Opera of Ukraine). But due to various family reasons the singer did not perform on the Kyiv stage till 2008. 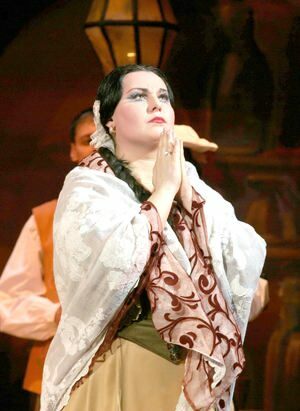 And in a matter of three years Monastyrska’s name has become a flagship of the Kyiv Opera. She has also sung at the Municipal Theater of Opera and Ballet for Children and Youth and toured a lot. The singer has recently returned from London, where she took part in productions of Aida and Macbeth, performing the leading parts. Ms. Monastyrska, does your triumph on one of the most prestigious stages of the world mean that Kyiv audience will not hear you anymore at home? Was it hard to work in such an extreme regime? For example, at the repertoire theater (the National Opera) there may be two premiere performances, then goes a big break and regular performances. What would you prefer? How much time is allotted for the production and performances? Every soloist wants to work with famous conductors. Who was at conductor’s stand during your London performances? At the moment in the West much attention is being paid to original directors’ interpretations of classical works, which is the main stumbling block for opera productions. What were the treats of Aida and Macbeth? “Aida was staged by English David McVicar, who is fond of special effects and playing to the audience. The equipment of the royal scene enables you to develop the action in various scales and levels. Some scenes seemed even dangerous for me, but everything went good, thank God. I cannot say that I liked the director’s production. I think that those were singers who made the production succeed. There was a star lineup: Roberto Alagna as Radames, Olga Borodina, Marianne Cornetti, and Anna Smirnova as Amneris, Vitaly Kovalev (who is Ukraine-born by instance, but has been residing for long in Switzerland and goes on tour worldwide) as Ramphis, Carlos Almaguer as Amonasro. “A renowned British director Phyllida Lloyd staged Macbeth [the Ukrainian audience knows her name, as she directed the musical Mama mia! – Author]. I liked her production more because the emphasis was made on psychological aspects of relations between Lady Macbeth and her husband. However, the special effects were present there too [sets designed by Anthony Ward. – Author], but, say, the beds flying above the stage, the red-black contrast in costumes and decorations worked to support opera’s idea. The beds put together meant marriage; when they were parted, it symbolized the collapse of the marriage. There was a lot of symbolism, but in my opinion it was very humane. My heroine is not absolute evil: she was given certain more humane features than in traditional interpretations of Shakespeare’s images. For example, I liked a lot the scene of a dream, when angels appeared over the marriage bed and brought babies to the Macbeth couple, though it was childless in fact. So, on the one hand, some attractive features of the heroine are revealed, but, at the same time, the punishment for her sins becomes graver. In the finale, in the somnambulism scene, Lady Macbeth loses her mind from understanding of her own sins and cuts her veins. Despite the scene is bloody, from the point of humaneness it makes my heroine more attractive. I wonder how the administration of Covent Garden organizes the routine of the invited singer. Do you come from a music family? How did your fellow singers and administration of your theater react to your success in London? Are you going to combine performances in Kyiv and abroad? “I really hope not to spoil relations with anyone and to work on the native stage as long as possible, as well as to perform abroad if it will be interesting for me. Thank God, the administration of the theater treats with understanding the performer’s desire to work abroad, it is enough to file a leave without pay and keep mutually respectful relations. I still have goals to achieve at the National Opera: I hope to sing the parts of Lady Macbeth and Tosca. I have sung it abroad long time ago: in Berlin, with Maria Gulegina, and at Puccini Festival in Torre del Lago last year. Is it true that after a performance you relax by singing Ukrainian songs?